The entirety of this reboot of The Muppets franchise is about why it’s necessary. The Muppets will be duking it out with Scream 4 for the title of “Most self-reflexive movie of 2011,” and sadly it’s the same mess of mixed quality and mediocre execution. 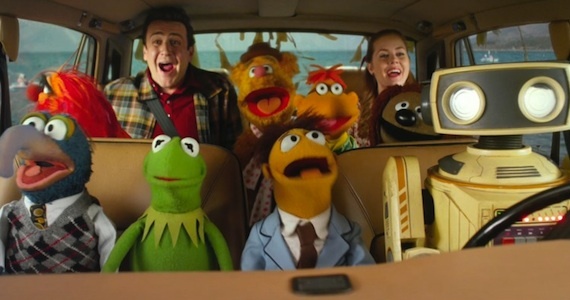 Jason Segel and Amy Adams play Gary and Mary, two people who, along with Gary’s Muppet brother Walter (voiced by Peter Linz), attempt to get the Muppet gang back together for a farewell show. Segel co-wrote the screenplay with Nicholas Stoller, and it’s unfortunate that such a worthy premise oddly can’t decide if it wants to be funny or not. In structure and (sometimes) tone this reboot resembles the Seinfeld Reunion season of HBO’s Curb Your Enthusiasm. Kermit The Frog (voiced by Steve Whitmire) joins the oddball trio to reassemble his Muppet posse, with Curb’s Seinfeld reunion line “We’ll do it in a way that won’t be lame,” being implied instead of spoken. The Muppets are battling to be relevant, and the visual gags and several self-reflexive references are made to do battle with forced pathos instead of being front-and-center.